Consumption of alcoholic beverages has been a prominent feature of many cultures since the ancient civilisations. Throughout history, the pros and cons of alcohol have been debated. Although the original debates stemmed from the public perception of intoxication, current research has convincingly demonstrated the permanent physiological damage due to prolonged overconsumption. However, the effect of “moderate” alcohol consumption on overall health remains controversial. The beneficial effects of alcohol on the cardiovascular system have been touted since the 18th century, but the bulk of scientific research has accumulated over the last few decades. The majority of the literature suggests that alcohol in moderation is beneficial on the cardiovascular system, and excess is detrimental to overall health. The deleterious effects of heavy alcohol consumption on health are numerous: aerodigestive cancers; haemorrhagic stroke and cardiomyopathy; hepatic cirrhosis; fetal alcohol syndrome; fatal car crashes, and suicides. However, these effects have not been documented among light to moderate drinkers. Moderate alcohol consumption, regardless of beverage type, reduces risk of coronary heart disease (CHD) among men and older women. 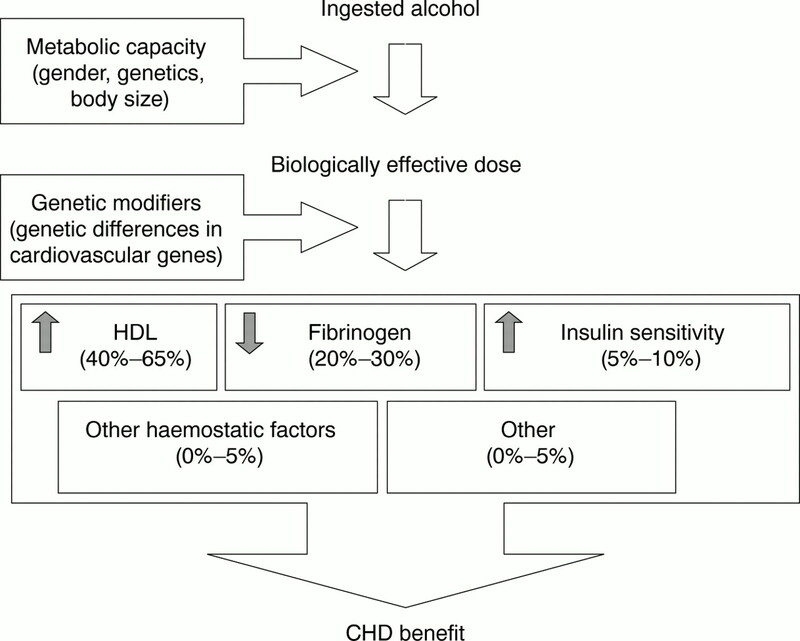 There is strong evidence to support that ethanol, the main constituent in alcoholic beverages, is causally related to lower risk of CHD through changes in lipids and haemostatic factors. The effect of alcohol on high density lipoprotein levels accounts for the majority of the reduction in risk of CHD, however, the mechanisms by which alcohol exerts its protective effect on the cardiovascular system are very complex and not completely understood. Genetic factors modify the effect of alcohol consumption on risk of CHD, resulting in population variability in the amount of benefit achieved from alcohol consumption. Although the risks substantially outweigh the benefits for heavy consumption, the burden of coronary heart disease (CHD) has tipped the scale in favour of moderate alcohol consumption for overall health. In the US and many westernised countries, CHD is the leading cause of mortality. It has been estimated that if moderate alcohol consumption lowered risk by even 25%, more deaths could hypothetically be prevented than caused by this exposure in westernised countries.1 However, the concern that promoting moderate alcohol consumption may lead to alcohol abuse among certain “at risk” individuals has muted the avocation of moderate alcohol consumption for health reasons. Evidence to support the cardioprotective effects of alcohol consumption among humans is abundant and strikingly consistent. Over 100 observational studies (cross cultural, case-control, prospective cohort) and over 80 short term human metabolic studies suggest cardiovascular benefits for 1–2 alcoholic beverages per day.2 Although a long term, large clinical trial of alcohol consumption and CHD would be optimal to confirm a causal association, it may not be feasible or ethical to conduct. However, there is overwhelming evidence from several epidemiological studies to support a causal association. Early epidemiological evidence to suggest an inverse association between moderate alcohol consumption and CHD was derived from ecological studies. These studies observed the correlation between alcohol intake and CHD mortality across countries. Data used in these ecological studies are typically based on estimated averages obtained from government agencies that tax the import, export, and sales of alcohol. As a whole, the majority of ecological studies support a strong inverse association between wine consumption and CHD mortality, but not for beer or spirits.3 However, specific benefits of wine beyond beer and spirits have not been confirmed with more methodologically sound study designs. Although ecological studies are suggestive, they are not confirmatory because of the inherent flaws in this study design. One major limitation of the ecological study is the inaccurate representation of an individual's typical intake. In some countries, a small proportion of the population may consume the majority of alcohol. Furthermore, alcohol sales data do not take into account the sale to visitors that would most likely vary by beverage and country. The most important limitation is the inability to account for other important factors associated with both alcohol consumption and CHD risk. For example, wine consumers in certain countries may have a higher socioeconomic status, which may provide better access to healthcare. Their lower risk of CHD could be attributed to better access to healthcare rather than alcohol consumption. Case-control and cohort studies are preferred to the ecological study because they focus on the individual, thus, they provide information on individual intake and account for other factors related to CHD more accurately. In general, case-control studies are fairly quick and easy to conduct, but the results are not as reliable due to the retrospective nature of the study design. In a typical case-control study, healthy individuals and individuals with CHD are asked to recall their alcohol consumption habits in the past. This can bias the results because prior knowledge of disease status could influence the reported level of alcohol consumption. Furthermore, it would be difficult to assess the effect of alcohol consumption on fatal CHD. There are several good case-control studies that indicate an inverse association; however, the most compelling evidence is based on large, prospective cohort studies.2-4 In a prospective study, information on alcohol consumption is collected from healthy individuals when the study is initiated, which minimises the susceptibility to biased recall of alcohol consumption. After several years of follow up, the association between baseline alcohol consumption and newly diagnosed CHD, both fatal and non-fatal, can be determined. Epidemiological studies have consistently shown that moderate alcohol consumption is associated with reduced risk of CHD; however, the exact mechanism for this association has not been completely elucidated. Over 80 experimental studies on humans have examined cardiovascular effects of alcohol on lipids, coagulation factors, and other cardiovascular markers.2 ,16 The majority of experimental studies utilised a crossover study design in which biological markers are measured among participants during abstinence and while consuming a fixed amount of alcohol after a wash-out period. Since these are relatively short term studies (less than three months), they are useful for providing information on the effects of alcohol on biological predictors of CHD and not on the effect of alcohol on clinical events. Early ecological data suggesting that wine was more beneficial than beer or spirits prompted many in vitro and in vivo studies of antioxidant and antiplatelet effects of wine, but substantial additional benefit has not been established.20-22 Rimmet al did not observe any appreciable difference of HDL levels according to beverage type, which is consistent with the evidence from prospective studies.16Overall, experimental studies suggest that ethanol, rather than other constituents of alcoholic beverages, is responsible for the cardioprotective changes. Although HDL accounts for the majority of the reduction in risk of CHD, the effects of alcohol extend beyond that of HDL. Both triglycerides and Lp(a), a form of low density lipoprotein containing apo(a), are often raised among individuals with CHD.25 ,26 The limited number of studies conducted on the association between alcohol consumption and Lp(a) levels have failed to show a consistent relationship.19 Studies have found a relatively weak but consistent positive association between alcohol and triglyceride concentration which may attenuate the benefit of alcohol on risk of CHD. Based on the meta-analysis conducted by Rimmet al, 30 g/day of alcohol would increase the triglyceride level by an estimated 0.06 mmol/l (5.69 mg/dl), resulting in a 1.9% increased risk of coronary heart disease.16 This minimal increase in risk is negligible relative to the substantial effect of alcohol consumption on HDL levels. Although not as well described, several studies have also investigated the influence of alcohol on coagulation and thrombolytic processes.16 ,27-31 Briefly, normal haemostasis is maintained through balance between coagulation and fibrinolytic proteins. Vascular injury results in platelet aggregates that contain fibrinogen/fibrin, which can ultimately generate a thrombin. Alcohol can alter levels and interactions of fibrinolytic proteins to assist in preventing thrombosis. In 1979, Meade et al demonstrated a positive association between alcohol consumption and fibrinolytic activity based on clot lysis time.27 Subsequent to the development of assays to measure the various cardiovascular markers of fibrinolytic activity, in vitro and in vivo studies have shown that alcohol affects fibrinogen levels, plasminogen activators, and plasminogen inhibitors.28 The effects on lowering levels of fibrinogen are the best documented and may contribute to the cardioprotective effects of ethanol. Based on the same meta-analysis by Rimm et al, fibrinogen is estimated to account for 20%–30% of the CHD benefit attributed to moderate consumption.2 ,16 Approximately 30 g/day of alcohol decreases fibrinogen by an estimated 0.075 g/l (7.5 mg/100 ml), which corresponds to a 12.5% reduction of CHD risk.16 Although not nearly as substantial as the role of HDL, fibrinogen appears to be the second biggest contributor to the reduction in CHD risk attributed to alcohol consumption. The development and application of new technologies has provided more insight to the effect of alcohol on the heart. In vitro and in vivo studies demonstrate that alcohol exerts its actions through several pathways that involve biochemical and molecular mechanisms of the normal and pathophysiological state of the heart. In addition to the previously discussed cardiovascular markers, alcohol affects the autonomic control adrenergic signalling, signal transduction in the myocardium, myocardial metabolism, and myocardial contractility.34 In order to fully understand how alcohol protects against CHD, it is necessary to elucidate all these complex mechanisms. Overall, epidemiological and experimental studies suggest that alcohol consumption decreases fibrinogen levels. There is some evidence to suggest that alcohol affects other haemostatic factors; however, the results are not consistent, which could be partially attributed to differences in collection and measurement methods. Another important source of variability, which was not accounted for in the majority of human studies, is genetic differences among the study subjects. Polymorphisms have been identified in CHD candidate genes, such as t-PA,35 PAI-1,36 and β-fibrinogen.37 Deciphering the human genome sequence has demonstrated that many genes contain variants, some of which will have an affect on the expression or function of the protein. These genetic differences may modify the effect of alcohol consumption on risk of CHD resulting in population variability in the amount of benefit achieved from alcohol consumption. For example, a few studies have suggested that the effect of alcohol intake on cholesterol levels is modulated by variability at the APOElocus.38 ,39 Thus, it is important to account for both genetic and lifestyle differences to better understand the causes of common chronic diseases such as heart disease. Genetic differences contribute to the variability in ethanol metabolic capacity among individuals, which may influence the effect of alcohol consumption on alcohol related diseases. The pharmacokinetics of ethanol metabolism have been well studied. Alcohol dehydrogenase (ADH) and the mitochondrial form of aldehyde dehydrogenase (ALDH2) are the two liver enzymes that are mainly responsible for alcohol metabolism.40 ,41 The class I ADH enzymes, encoded by theADH1, ADH2 andADH3 genes, are responsible for oxidising alcohol (ethanol) to acetaldehyde, and ALDH2 is responsible for acetaldehyde oxidation. Among the class I ADH genes, polymorphisms inADH2 and ADH3result in three different forms ADH2 enzyme (β1, β2, β3) and two different forms of the ADH3 enzyme (γ1, γ2). These variants are known to produce enzymes with distinct kinetic properties. There are also two forms of the ALDH2 enzyme. The enzyme encoded by the variantALDH2*2 allele has very low activity, resulting in a flushing response due to the toxicity of acetaldehyde. The frequencies of these variants highly depend on the ethnicity of the population. Among Caucasian populations, variant alleles are very rare at theADH2 and ALDH2locus, but common at the ADH3 locus (approximately 55% γ1: 45% γ2). This would suggest that the polymorphism at theADH3 locus would account for some of the variability in ethanol metabolic capacity among Caucasians. Among men in the Physicians' Health Study, moderate drinkers who were homozygous for the ADH3 allele encoding for the slower enzyme (γ2) had a greater reduction in risk of heart disease compared with moderate drinkers who were homozygous for theADH3 allele encoding for the faster enzyme (γ1).42 Moderate drinkers who were homozygous for the ADH3 allele encoding for the slower enzyme (γ2) also had the highest HDL levels; a similar observation was made among 325 postmenopausal women who were not taking postmenopausal hormones. Since the predominant function of ADH3 is to metabolise ethanol, this study strengthens the evidence that the reduction in risk of heart disease is attributed to the ethanol in alcoholic beverages. Other contributors to the variability in alcohol metabolism are factors that can regulate the activity of the genes involved in alcohol metabolism. Glucocorticoids, growth hormone, and retinoids have been shown to induce ADH activity.43-45 To what extent that these factors contribute to population variability in alcohol metabolism needs to be determined. To complicate the situation further, a number of in vitro studies have shown that ethanol influences gene expression in a variety of genes that may ultimately contribute to the development of heart disease, such asPPARα,46 P4502E1,47 c-myc,48 t-PA,49 u-PA,49 andPAI-1. 50 Using cultured human endothelial cells, Grenett et al demonstrated that low doses of ethanol downregulate transcription of thePAI-1 gene, and upregulate transcription of both t-PA andu-PA gene expression.50 This study indicates a biphasic increase (very rapid, <30 min) in fibrinolytic activity and a sustained long term effect (>12 hours) involving increases in both t-PA andu-PA expression. Studies on the effects of alcohol consumption on gene regulation are limited, and further research in this area is warranted. As described in this review, the mechanisms by which moderate alcohol consumption exerts its beneficial effects on the cardiovascular system are complex and not completely understood. To summarise, a simplified illustration of this complicated process is hypothesised in fig1. Mechanisms by which moderate alcohol consumption exerts its beneficial effects on the cardiovascular system (CHD = coronary heart disease; HDL = high density lipoprotein). Relatively few studies have assessed the significance of drinking pattern on risk of CHD. Based on experimental studies, there is some evidence to suggest that the regularity of consumption and the accompaniment of food can alter the effect of alcohol on various cardiovascular markers.51 ,52 Epidemiological studies have shown that individuals consuming the entire week's allocation in a few days have either less or no benefit from alcohol consumption.53 ,54 Sporadic heavy drinking may increase cardiovascular and stroke risks.54 There is no clear evidence to suggest that alcohol consumption with meals is different from alcohol consumption without meals on risk of CHD; however, there is some evidence to support that binge drinking is not beneficial. Recent prospective studies indicate that high risk populations, men and women with diabetes, hypertension, or previous myocardial infarction, have a lower risk of subsequent CHD mortality with moderate alcohol consumption.55-57 The limited evidence to suggest a beneficial effect of alcohol consumption on subsequent CHD among high risk populations is consistent, but limited to only a few studies. Thus, clinical advice advocating moderate alcohol consumption to patients with CHD, diabetes, or hypertension should be considered cautiously. Although lifetime mortality from CHD is similar between men and women, the disease primarily affects middle aged men and older women. Premenopausal women and postmenopausal women that use postmenopausal hormones have a substantially lower risk compared with men, suggesting a cardioprotective role of ovarian hormones. Experimental studies have shown that this is achieved through multiple mechanisms, such as increasing HDL levels, decreasing low density lipoprotein levels, and other vasculoprotective effects.58 There is some evidence to suggest that moderate alcohol consumption affects oestrogen levels.59 The effects of alcohol on the incidence of CHD could be associated with the effect of alcohol on oestrogen levels. Since the incidence of CHD in premenopausal women is virtually non-existent, it is difficult to assess the association between alcohol consumption on CHD risk in this population. However, epidemiological studies support a protective effect of alcohol consumption on CHD risk in postmenopausal women, and this benefit appears to be with lower levels of alcohol consumption (one drink/day).4 The gender difference is attributed to three main factors: (1) body size, (2) alcohol solubility, and (3) efficiency of alcohol metabolism.60 Alcohol is more soluble in body water than in body fat, and women typically have a higher proportion of body fat compared with men. Furthermore, the activity of ADH in the stomach and the first pass metabolism of alcohol before it enters systemic circulation are both lower in women. Thus, postmenopausal women achieve similar cardiovascular benefits from moderate alcohol consumption compared to men, but with lower levels of consumption. The evidence to support a beneficial effect of alcohol consumption on cardiovascular health is overwhelming. However, is this evidence compelling enough to recommend moderate alcohol consumption from a public health perspective? Policies and legislation on alcohol consumption vary widely across countries. In some countries where CHD is the leading cause of mortality, the benefit of moderate alcohol consumption has been incorporated in the dietary guidelines. In the US, dietary guidelines on alcohol consumption are continuously modified to stay consistent with the scientific literature.61 Although the guidelines do not go as far as recommending alcohol to those who abstain, they do state that drinking in moderation may lower risk for CHD, mainly among men over age 45 and women over 55, with moderation defined as one drink/day for women and two drinks/day for men. A typical drink is equivalent to one 12 ounce can of beer, one 5 ounce glass of wine, or 1.5 ounces of 80 proof spirits. As demonstrated in this review, the mechanisms by which alcohol affects the cardiovascular system, as well as many other systems, is complex. A more complete understanding of these mechanisms will assist in making recommendations at the individual level, which would be the most effective means for promoting overall health. With any medical advice where there is risk and benefit, we should be cautious in framing guidelines for alcohol and remember to keep them in the larger context of other lifestyle factors, such as exercise and diet, which we know can lower risk of chronic disease. (1996) Alcohol and risk of coronary events. in Alcohol and the cardiovascular system. NIH Publication No 96–4133. eds Zahkari S, Wassef M (National Institutes of Health, Bethesda, MD), pp 15–24. Rimm EB, Stampfer MJ. Alcohol abstinence: a risk factor for coronary artery disease. In: Braunwald E, ed. Heart disease update series. Philadelphia: W B Saunders, Vol 2, No 3, 2000: 1–10. (1996) Review of moderate alcohol consumption and reduced risk of coronary heart disease: is the effect due to beer, wine, or spirits? BMJ 312:731–736. (1999) Alcohol and the cardiovascular system. in Health issues related to alcohol consumption. ed MacDonald I (Blackwell Science, Oxford), pp 125–179. (1999) Alcohol intake and cardiovascular morbidity and mortality. Curr Opin Nephrol Hypertens 8:353–357. (2001) Is wine good for your heart? A critical review. Postgrad Med J 77:172–176. (1980) Frequency of alcohol consumption and morbidity and mortality: the Yugoslavia Cardiovascular Disease Study. Lancet i:613–616. (1998) Alcohol and mortality in middle-aged men from eastern France. Epidemiology 9:184–188. (1997) Follow-up study of moderate alcohol intake and mortality among middle aged men in Shanghai, China. BMJ 314:18–23. (1998) Alcohol intake and premature coronary heart disease in urban Japanese men. Am J Epidemiol 147:59–65. (1995) Mortality associated with moderate intakes of wine, beer, or spirits. BMJ 310:1165–1169. (1994) Mortality in relation to consumption of alcohol: 13 years' observations on male British doctors. BMJ 309:911–918. (1998) Alcohol, coronary heart disease and stroke: an examination of the J-shaped curve. Neuroepidemiology 17:288–295. (1991) Prospective study of alcohol consumption and risk of coronary disease in men. Lancet 338:464–468. (1990) Risk of cardiovascular mortality in alcohol drinkers, ex-drinkers and nondrinkers. Am J Cardiol 66:1237–1242. (1999) Moderate alcohol intake and lower risk of coronary heart disease: meta-analysis of effects on lipids and haemostatic factors. BMJ 19:1523–1528. (1987) Lipoproteins as mediators for the effects of alcohol consumption and cigarette smoking on cardiovascular mortality: results from the Lipid Research Clinics Follow-up Study. Am J Epidemiol 126:629–637. (1992) Lipoproteins and blood pressure as biological pathways for effect of moderate alcohol consumption on coronary heart disease. Circulation 85:910–915. (1996) Alcohol, lipids, and lipoproteins. in Alcohol and the cardiovascular system. NIH Publication No 96–4133. eds Zahkari S, Wassef M (National Institutes of Health, Bethesda, MD), pp 369–391. (1993) Inhibition of oxidation of human low-density lipoprotein by phenolic substances in red wine. Lancet 341:454–457. (1995) Effect of red wine ingestion on the antioxidant capacity of serum. Clin Chem 41:32–35. (2000) (+)-Catechin in human plasma after ingestion of a single serving of reconstituted red wine. Am J Clin Nutr 71:103–108. (1995) Effects of alcohol consumption of lipoproteins of premenopausal women: a controlled diet study. Arterioscler Thromb Vasc Biol 15:179–184. (1993) Moderate alcohol intake, increased levels of high-density lipoprotein and its subfractions, and decreased risk of myocardial infarction. N Engl J Med 329:1829–1834. (2001) Serum triglycerides and risk of coronary heart disease among Japanese men and women. Am J Epidemiol 153:490–499. (1986) Lp(a) lipoprotein as a risk factor for myocardial infarction. JAMA 256:2540–2544. (1979) Characteristics affecting fibrinolytic activity and plasma fibrinogen concentrations. BMJ i:153–156. (1996) Alcohol and the fibrinolytic system. in Alcohol and the cardiovascular system. NIH Publication No 96–4133. eds Zahkari S, Wassef M (National Institutes of Health, Bethesda, MD), pp 393–411. (1993) Antigens of tissue plasminogen activator and plasminogen activator inhibitor 1: correlates in nonsmoking Japanese and Caucasian men and women. Thromb Haemost 70:475–480. (1994) Association of moderate alcohol consumption and plasma concentration of endogenous tissue-type plasminogen activator. JAMA 272:929–933. (1990) Effects of moderate alcohol consumption on platelet function, tissue-type plasminogen activator and plasminogen activator inhibitor. Thromb Haemost 63:345–348. (1996) Insulin sensitivity and regular alcohol consumption: large, prospective, cross sectional population study (Bruneck study). BMJ 313:1040–1044. (1996) Association of dietary composition with fasting serum insluin level: the ARIC study. Nutr Metab Cardiovasc Dis 6:194–202. (1996) Cellular and molecular mechanisms of smooth muscle. in Alcohol and the cardiovascular system. NIH Publication No 96–4133. eds Zahkari S, Wassef M (National Institutes of Health, Bethesda, MD), pp 461–478. (1986) The human tissue plasminogen activator gene. J Biol Chem 261:6972–6985. (1991) Genetic variation at the plasminogen activator inhibitor-1 locus is associated with altered levels of plasma plasminogen activator inhibitor-1 activity. Arterioscler Thromb 11:183–190. (1995) Polymorphisms of the beta fibrinogen gene and plasma fibrinogen concentration in Caucasian and Japanese population samples. Thromb Haemost 73:106–111. (2000) Gene-nutrient interactions: dietary behaviour associated with high coronary heart disease risk particularly affects serum LDL cholesterol in apolipoprotein E ε4-carrying free-living individuals. Br J Nutr 84:885–890. (200) Alcohol drinking determines the effect of the APOE locus on LDL-cholesterol concentrations in men: the Framingham Offspring Study. Am J Clin Nutr 73:736–745. (1988) Genetic polymorphism of enzymes of alcohol metabolism and susceptibility to alcoholic liver disease. Mol Aspects Med 10:147–158. (2000) Pharmacogenetics of responses to alcohol and genes that influence alcohol drinking. J Stud Alcohol 61:5–12. (2001) Genetic variation in alcohol dehydrogenase and the beneficial effect of moderate alcohol consumption on myocardial infarction. N Engl J Med 344:549–555. (1988) Regulation of gene expression of class I alcohol dehydrogenase by glucocorticoids. Proc Natl Acad Sci U S A 85:767–771. (1989) Influence of growth hormone on the synthesis of rat liver alcohol dehydrogenase in primary hepatocyte culture. Arch Biochem Biophys 274:548–555. (1991) Retinoic acid response element in the human alcohol dehydrogenase gene ADH3: implications for regulation of retinoic acid synthesis. Mol Cell Biol 11:1638–1646. (2001) The transcriptional and DNA binding activity of perosixome proliferator-activated receptor α is inhibited by ethanol metabolism. J Biol Chem 276:68–75. (1994) Ethanol-inducible cytochrome P4502E1: regulation, enzymology and molecular biology. Alcohol Alcohol Suppl 2:131–139. (1996) The effect of starvation and ethanol on c-myc messenger RNA expression in the heart (abstract). Biochem Soc Trans 24:212S. (1998) Ethanol transcriptionally upregulates t-PA and u-PA gene expression in cultured human endothelial cells. Alcohol Clin Exp Res 22:849–853. (2000) Ethanol downregulates transcription of the PAI-1 gene in cultured human endothelial cells. Thromb Res 97:247–255. (1994) Effect of moderate dose of alcohol with evening meal on fibrinolytic factors. BMJ 308:1003–1006. (2000) Effects of alcohol and the evening meal on shear-induced platelet aggregation and urinary excretion of prostanoids. Alcohol Alcohol 35:594–600. (1988) Alcohol and cardiovascular disease. Proc Nutr Soc 47:99–110. (1997) Beer binging and mortality: results from the Kuopio ischaemic heart disease risk factor study, a prospective population based study. BMJ 315:846–851. (2000) Alcohol intake and the risk of coronary heart disease mortality in persons with older-onset diabetes mellitus. Circulation 102:494–499. (2000) Alcohol consumption and risk of coronary heart disease by diabetes status. Circulation 102:500–505. (1998) Mortality and light to moderate alcohol consumption after myocardial infarction. Lancet 352:1882–1885. (1996) Alcohol, coronary artery disease, and estrogen. in Alcohol and the cardiovascular system. NIH Publication No 96–4133. eds Zahkari S, Wassef M (National Institutes of Health, Bethesda, MD), pp 647–661. (1998) Moderate alcohol consumption and estrogen levels in postmenopausal women: a review. Alc Clin Exp Res 22:994–997. (2000) The health effects of moderate alcohol intake in humans: an epidemiologic review. Clin Rev Clin Lab Sci 37:261–296. (1995) Nutrition and your health: dietary guidelines for Americans. (US Government Printing Office, Washington, DC), 4th Ed.